The major stock market indices continued to surge to ever higher record levels during the third quarter despite a lot of hot air emanating from Pyongyang and Washington as well as Nature’s fury as witnessed in Texas and Florida. The market has done some backing and filling along the way but there was little doubt that the prevailing direction was upward as the Dow jones Industrial Average rose in eight of the period’s thirteen weeks. The venerable index broached the 22,000 level for the first time and in mid-October is poised on the brink of 23,000. The assault has been led by a handful of tech and internet stocks as fewer and fewer individual issues have been able to match the indices all-time highs. Declining breadth is typically an early warning of an approaching correction and several technical indicators – especially those related to contrary opinion – are also flashing a caution light. Nonetheless, the bulls remain in full command for now. Initial Public Offering (IPO) fever is often a symptom of a frothy market but this time around stock offerings are being trumped by coin offerings (CPO’s). Speculators are tossing billons into cyber coins in hopes of reaping gains like those enjoyed by early Bitcoin aficionados. Alas, those who ignore history are condemned to repeat it and such episodes in the past have typically ended very badly. While the Dow was tacking on a price gain of 4.5%, thereby making the year-to-date total a handsome 13.4% return (without dividend reinvestment), commodity prices fared even better as energy prices, boosted by the hurricanes, led the way. The Commodity Research Bureau’s index rose 4.8% during the quarter. Bonds, meanwhile, suffered price setbacks as interest rates backed up across the maturity spectrum. The economy showed improvement in the second quarter as real GDP rose 3.1% - a level just shy of long-term trend growth. The improvement over the first quarter’s meager 1.4% rate was due largely to a healthy increase in personal consumption expenditures. Consumers opened their purse strings despite wage growth remaining relatively subdued compared to the historical norm for a recovery. Harvey and Irma delivered a 1-2 combination to the Southeast and the summer’s economic data were thereby skewed to the downside. Initial claims for state unemployment insurance benefits, which were near historically low levels prior to the storms, surged in the weeks following them and the payroll report for September registered a decline. In subsequent weeks, however, claims have ebbed and further moderate payroll growth appears likely to ensue. We have already mentioned the increase in commodity prices that was initiated largely by the storms but there are also some incipient signs that long dormant inflation might be awakening at last. The year-over-year change for the PPI and CPI are both now north of the Fed’s 2% target rate. Furthermore, the most recent survey by the Institute for Supply Management indicates that 71.5% of the respondents are seeing higher prices for the goods and services that they purchase. The Fed took no further action during the period but another increase in the fed funds rate is widely anticipated before the end of the year. No doubt the stock bulls and cyber coin enthusiasts are having way too much fun to suit the grinches at the central bank. In the Sporting News, the defending World Champion Chicago Cubs (mirabile dictu) put together an outstanding record in the second half of the season and secured the NL’s Central Division yet again. This was in sharp contrast to the days of yore when all too frequent late season swoons by the Cubbies prompted one wag to suggest moving the team to the Philippines and renaming them the Manila Folders. The stock market provided the happy news over the summer months but the big story was the havoc and human suffering wreaked by Harvey and Irma in the Caribbean, Texas, Florida and the Gulf Coast. Much has been written about the conflict of Man versus Nature and lately much of it has been focused on Man’s mistreatment of Nature – a controversial topic that we shall leave to others. Let there be no doubt, however, that Nature gets her licks in as well. A satellite image that shows a hurricane’s pattern extending throughout almost the entirety of the Gulf of Mexico is something that inspires awe. On August 21 our area of the country was treated to one of the greatest shows on Earth – a total solar eclipse. The centerline ran through our cousin’s farm in southern Kentucky just north of the Tennessee border. The duration of totality was two minutes and forty seconds. Using a moderately sized telescope with a camera attached, we captured a number of nice images, two of which are shown below. 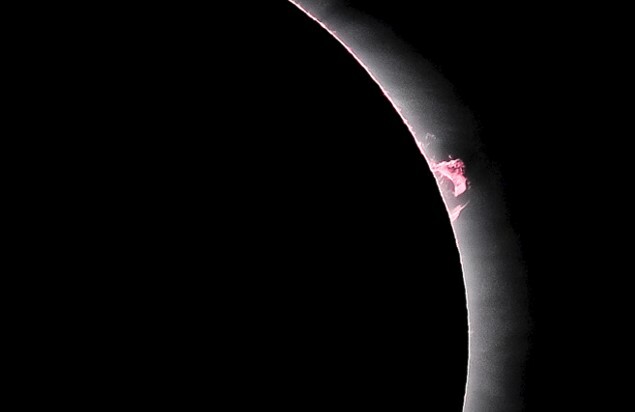 The second one is an enlargement that shows details of a solar prominence extending into space from the surface of the Sun. We did the math and said prominence was about 38,000 miles high. To put that into context, almost five Earth diameters would fit inside it. That, dear reader, is what “awesome” is all about.